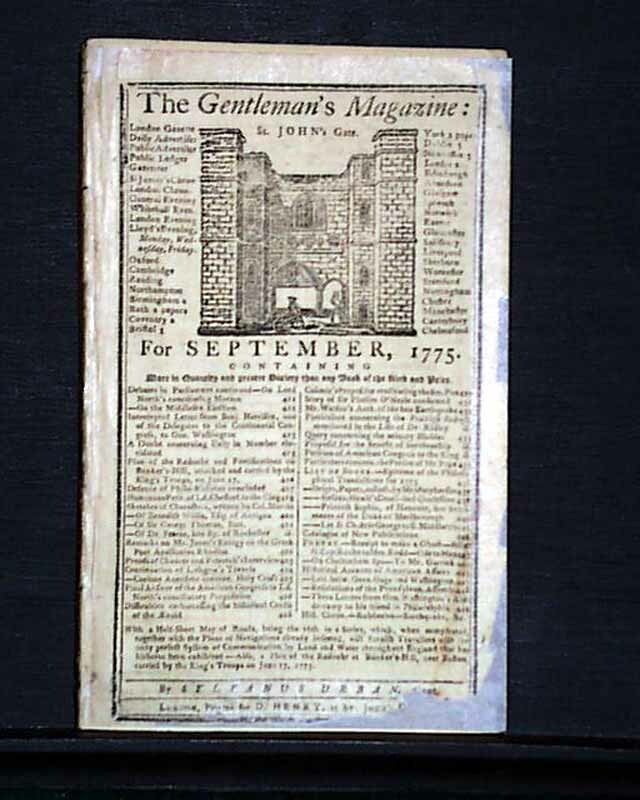 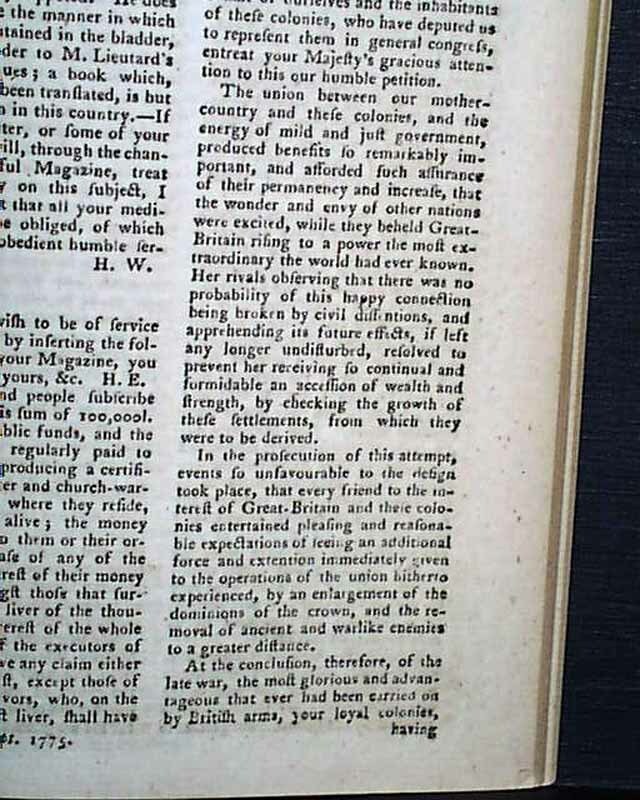 Item # 654915 THE GENTLEMAN'S MAGAZINE, London, England, September, 1775 A nice issue with much historic content from the beginning months of the Revolutionary War. 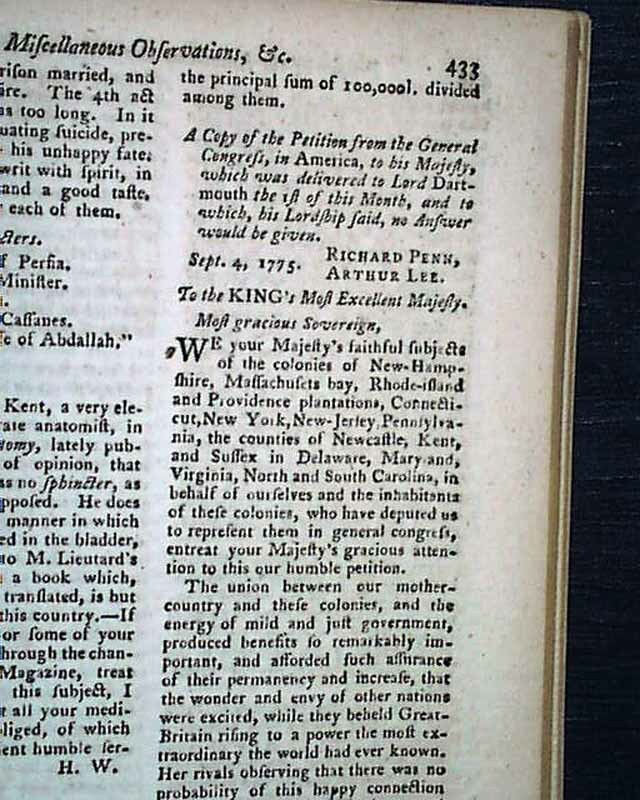 Perhaps the best content is the very nice half page illustration of the "Redoubt & Entrenchment on the Heights of Charles Town, Commonly called Bunker Hill, Opposite Boston, attacked & Carried by his Majesty's Troops, June 17, 1775" with some text on the illustration as well. 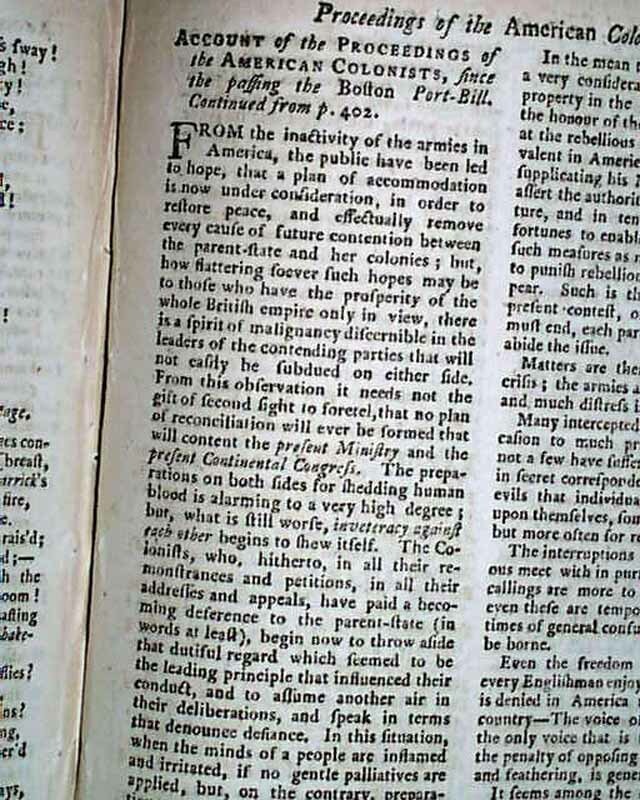 A great graphic relating to the Battle of Bunker Hill (see). 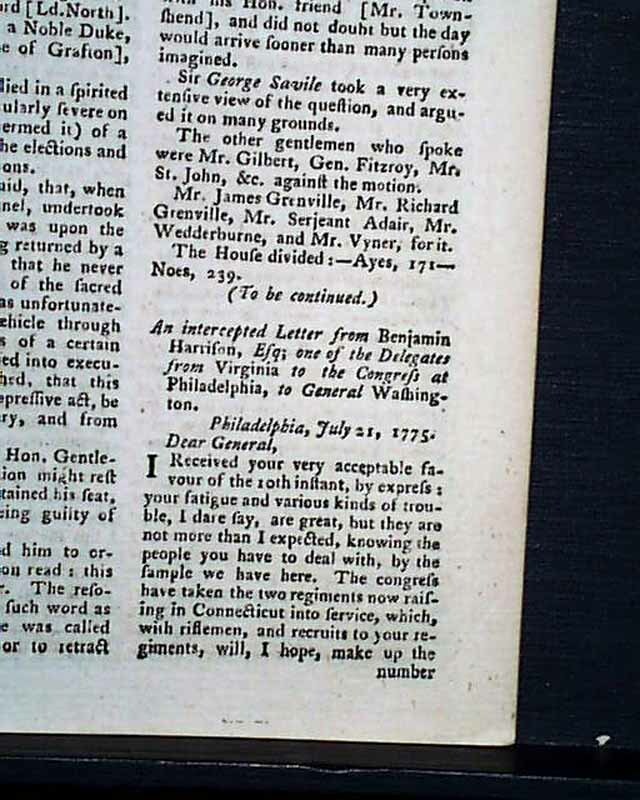 Also in the issue is an article: "An Intercepted letter from Benjamin Harrison to General Washington" which contains much on events of the war and takes nearly two pages. 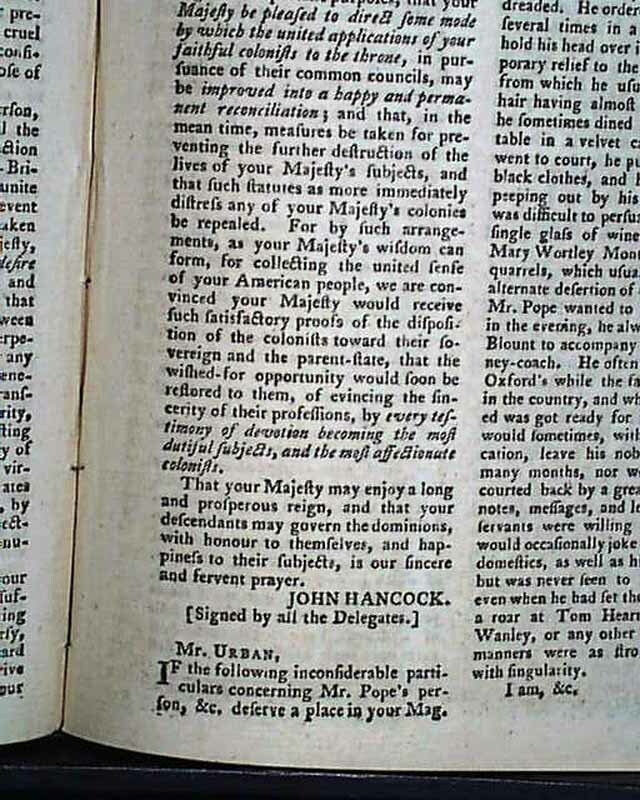 There is also a great & lengthy article titled: "Resolutions of Congress on the Conciliating Proposition of Parliament" on Congress rejecting the conciliation plan of Lord North, which takes over 2 pages and is signed in type: JOHN HANCOCK. 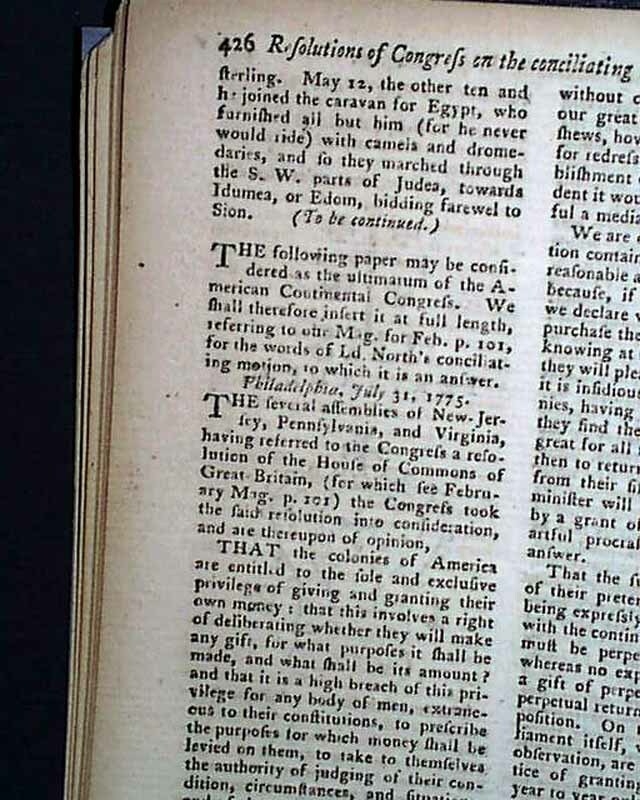 The article begins: "The following paper may be considered as the ultimatum of the American Continental Congress..." and has a dateline of Philadelphia, July 31, 1775 (see photos for portions). 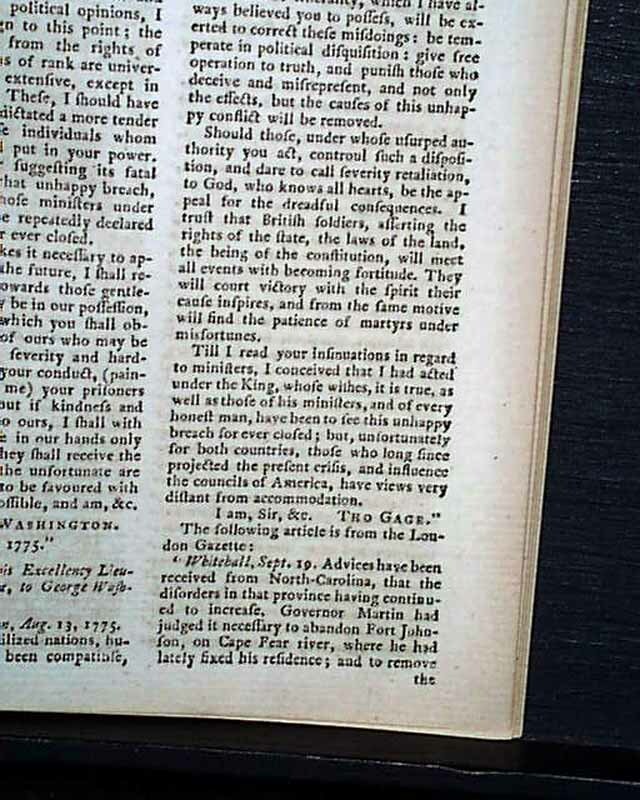 Also: "Petition of the American Congress to the King" which is signed in type: John Hancock, and an excellent article: "Account of the Proceedings of the American Colonists since Passing the Boston Port Bill". 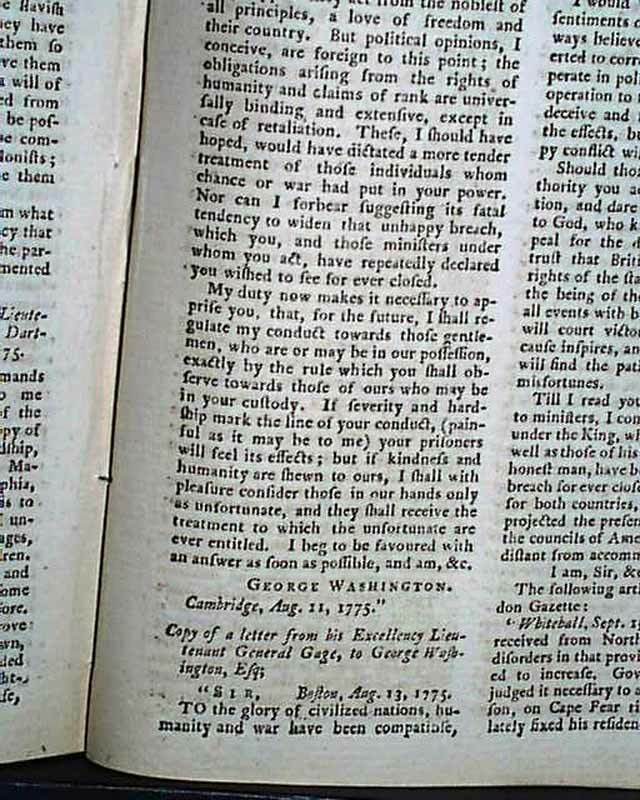 Within this article is a nice letter to General Gage, signed in type: George Washington, with his reply signed: Tho. 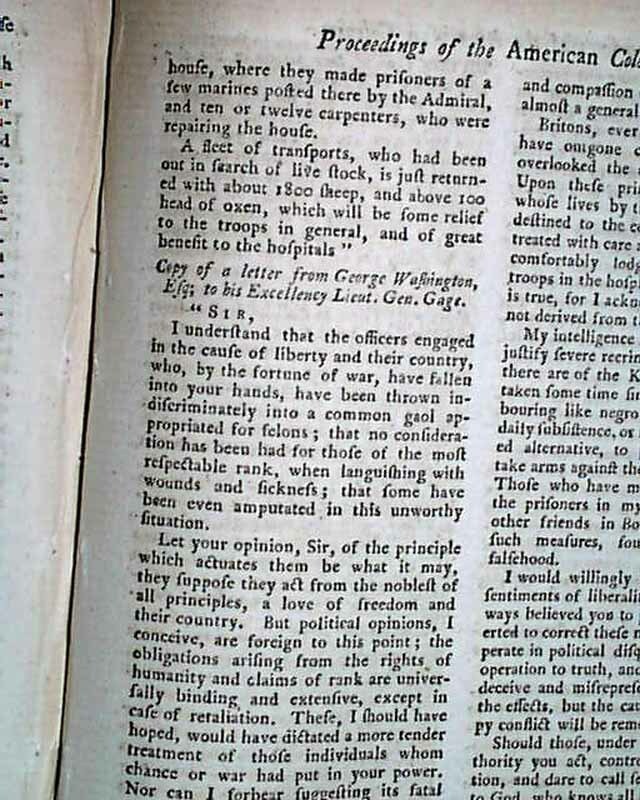 Gage, concerning the treatment of prisoners. 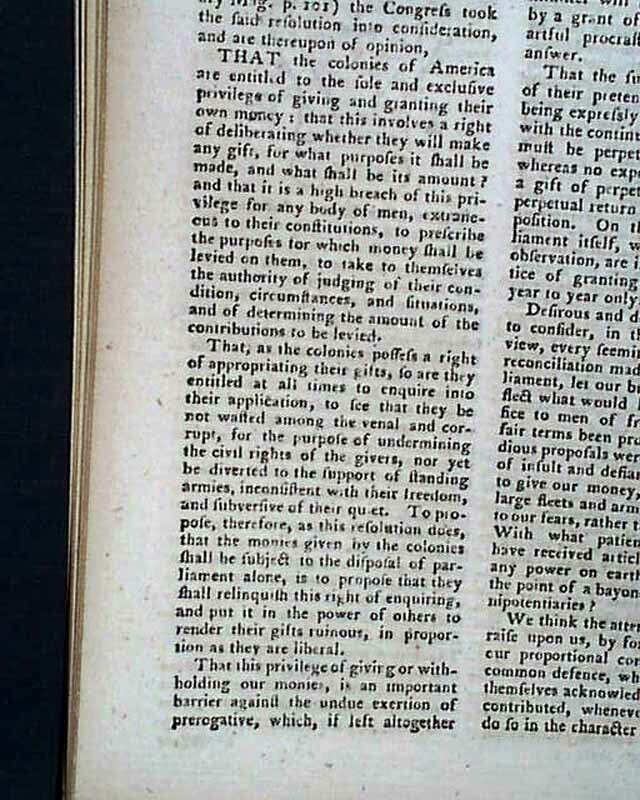 This full report takes 5 1/2 pages. 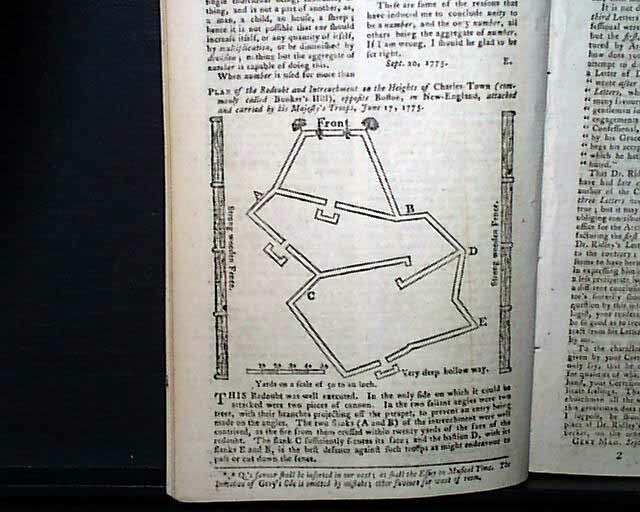 Lacking the foldout map of roads in England called for. 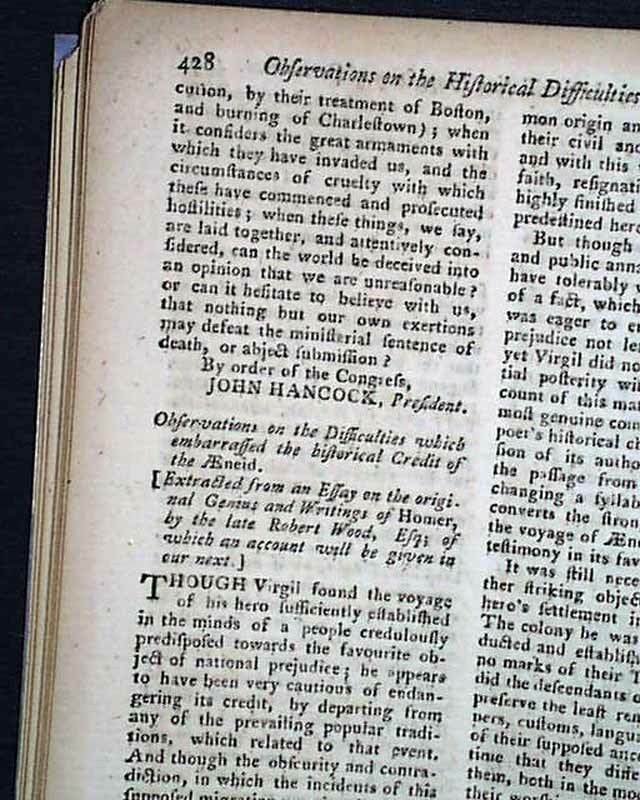 Complete in 48 pages, 5 1/4 by 8 1/4 inches with archival mending tape reinforcement of the right and bottom margins of the front page, full title/contents page with an engraving of St. John's Gate, otherwise in very nice condition.